Bring the North Pole to your front yard! These busy penguins are decorating their igloo. Look at their festive scarves! Wouldn’t they look great in your yard!! I’ll tell you, my neighborhood goes all out. Actually, I think there are a couple of neighbors who try to out-do each other. It’s all in fun — not like in the movies. But it makes it difficult for the rest of us to have something different and spectacular . . .
Now, I love the Christmas decorating . . . more to look at than to actually do . . . but this year I got into the spirit and fell in love with these industrious little penguins. This outstanding display has a wire frame base, the igloo is covered with spun acrylic and the adorable penguins are made with tinsel fabric. 200 incandescent mini lights make a delightful nighttime glow that can be seen throughout the neighborhood! Hee hee!! This North Pole igloo sculpture measures 36 inches tall and 48 inches wide. Not too big . . . and not too small. These pre-lit mini lights are great! If one bulb burns out, the others stay lit, but you’ll receive replacement bulbs. Ground stakes are included to keep the display upright and in place. I like it because I love penguins . . . but also because it’s easy to assemble and set up. 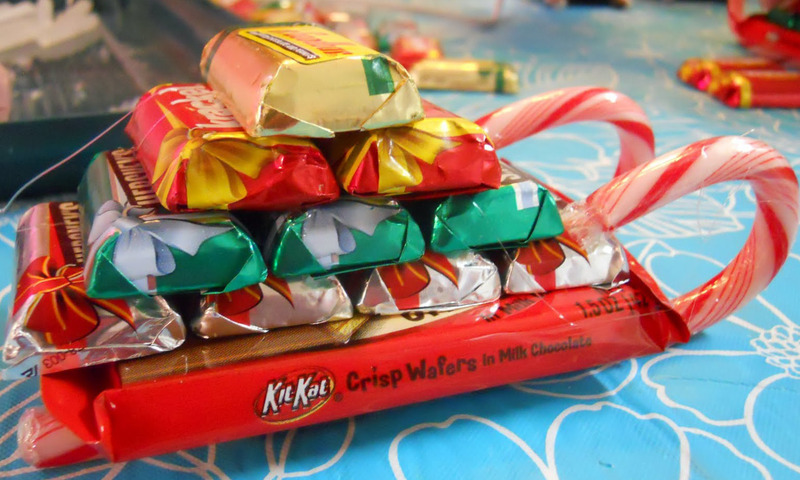 When I saw these candy sleighs, I knew I had to make these. As you look at the image, you’ll get the idea of how to make them. You can use mini candies or you could use homemade candies or cookies. If you want to go that route, I’d get my candy canes set and have a square cookie or brownie as the base. I’d wrap the brownie and find something non-toxic to attach to the wrapped candy canes. Some people use hot glue which is fine for them. I’m not into burning myself so I go for Elmer’s School Glue, but you find what works for you. Then as you can see, you’re building a pyramid. They make great gifts when you add ribbon and a bow on top. These are good to have around for neighbors who stop by during the holidays. Now, get started . . . you know the children will want to give them to their friends . . . maybe even their teacher . . . you’re going to need them for your neighbors and friends . . . family will want them too . 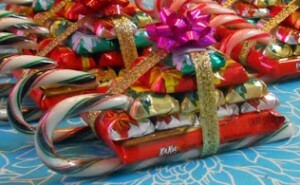 . . how large is your demand growing for this clever and tasty gift? Thanks for stopping by! We’ll have more . 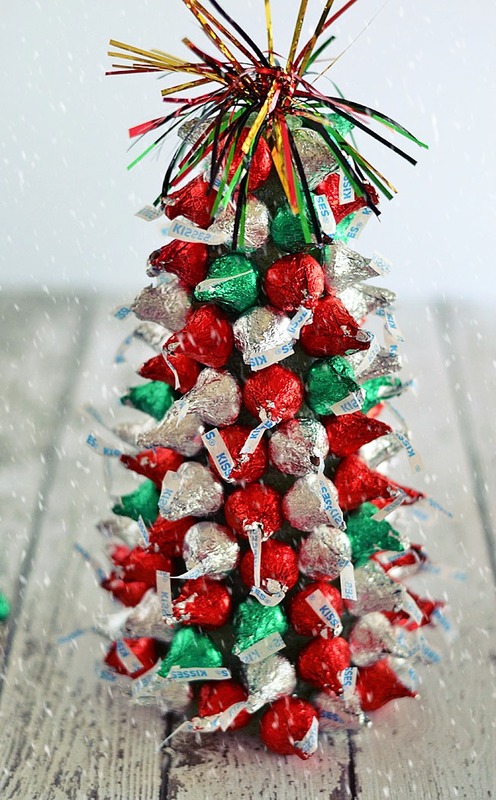 . .
Here’s a wonderful Christmas Tree Centerpiece that’s good enough to eat! I doubt it’s going to last through Christmas . . . maybe I should buy some more bags of Hershey Kisses . 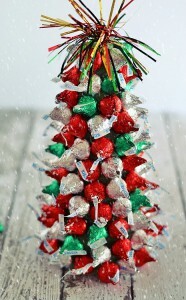 . .
To make this “Kiss-Mas-Tree” you need to begin with a foam cone from your favorite craft store or dollar store. Select the size that suits the centerpiece you want to create. I ended up going for a large one and a couple of small ones. I know I’ll have nibblers — sneaky little angels they are. You can go for the red and green ones and add the traditional silver ones for good measure or go totally silver or divide them up as I did. I made a silver and green small tree, a silver and red small tree and my large one I did with the silver, red and green. These little kisses aren’t as soft as one would imagine. You’re going to need to have a clean turkey skewer to use to poke a little hole in the bottom of each Hershey Kiss. I used wooden round toothpicks, broke them in half . . . to secure the kiss on the toothpick and then stick it into the foam cone. I started from the bottom and worked my way around, then up to the top. It’s a fun project for the kids to do, but keep an eye on the kisses . . .
For the top, you can get creative with the colorful garland or ribbon or stars . . . allow your imagination to go crazy! There are all kinds of great decorative touches available that you can buy and use to top these little trees off right. 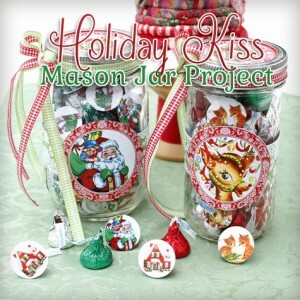 Putting these kisses in a small jar as hostess gifts is also a good idea. I’ll need to look into finding some labels . . . but you can use any of your tree topper left-overs to decorate the lids of the jars. Something to think about. Here are labels that will do these proud. Click the link under the picture and you’ll have more labels than you may originally thought you’d need. I like being able to decorate the bottom of the kisses — they look nice through the jar. The jar labels for the front and also for the top and the lid can be embellished, too. Be sure to check these out . 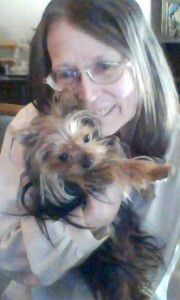 . .
Have A Happy and Joyous Thanksgiving Day! Thanksgiving means many things to many people. We may have a few things in common when the word Thanksgiving comes up in conversation. I think of Family and Traditions first, then I get into Grateful, Blessings and the old hymn of gathering together. Then Harvest and food come to mind. Of course, Fall is important and pumpkins and the colorful leaves. Then I see on the news how flights have been canceled or delayed. Families frantically trying to get to their loved ones to share this wonderful holiday. It is all about family, caring and sharing . 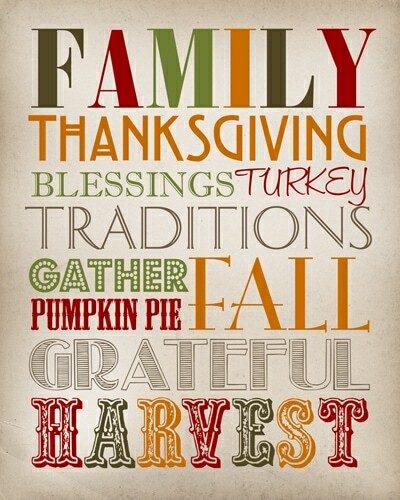 . . and taking the time to be thankful and to count our many blessings. No matter what is going on in our lives, the loss of a friend or family member, hardship in whatever form that takes . . . it is a time to reflect and be grateful for what we do have . . . there is always something to be thankful for . . . not just at Thanksgiving, but throughout the year. I hope you enjoyed this. Have a Happy Thanksgiving! A hearty breakfast is a “must have” on Thanksgiving Day or Christmas Day. Those days when you’ll be waiting for dinner . . . maybe Easter Day, too. I’m not picky — this is a great breakfast casserole you can make any time. Grease an 8 ounce square baking dish. 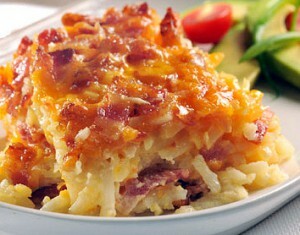 Layer 1/2 of the potatoes, 1/2 the chopped onion, 1/2 the crumbled bacon and 1/2 the cheese. Repeat for the remaining potatoes, onion, bacon and cheese. Combine the egg and milk in a small bowl. Pour evenly over potatoes, etc. in the baking dish. Bake in the oven for 55 to 60 minutes. Uncover. Bake for an additional 5 to 10 minutes. This simple recipe is a real hit with family and friends. Give it a try. Add other ingredients or substitute ingredients. This would work well with left over turkey, ham or whatever left-overs you may have.